A microscope add-on for your phone for just $10? No wonder it's winning awards. Mobile phones have become one of the most universal pieces of advanced technology in the world, and they are about to become even more vital. Aydogan Ozcan of UCLA has developed a microscope attachment for a cell phone – turning the device into a sort of mobile medical lab. It’s both lightweight (~38g or 1.5 oz) and cheap (parts cost around $10). 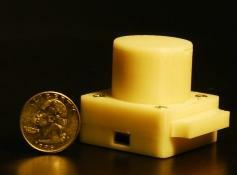 As described in the journal Lab on a Chip, the cellphone microscope can analyze blood and saliva samples for microparticles, red blood cells, white blood cells, platelets, and water borne parasites. Ozcan and his team have recently won three prestigious awards for the device: a Grand Challenges award from the Bill and Melinda Gates Foundation (worth $100,000), the National Geographic Emerging Explorer award (worth $10,000), and the CAREER award from the National Science Foundation ($400,000). With these funds, Ozcan plans on starting case studies in Africa to see how the microscope can help revolutionize global medicine. 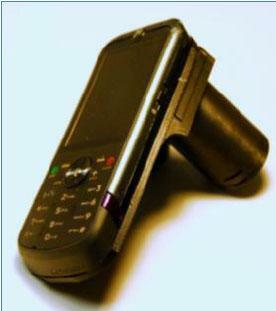 LUCAS cell phone attachment. Disposable slides (not pictured) would fit into the sample holder. Ozcan isn’t the only researcher looking to combine cellphone and microscope, the Cellscope from UC Berkeley was developed with similar medical goals in mind. Yet Ozcan’s device stands out for its unique approach and success. Termed the Lensless Ultrawide field Cell monitoring Array platform based on Shadow Imaging (LUCAS), the microscope uses an LED to illuminate a sample and then analyze the sample’s shadow to get information. You can read more about that analysis in our original article on the device. LUCAS’s main advantage over other systems is that it uses no lenses or lasers, so its very cheap and can fit into a small space with little weight. For just $10 you can put a microscope on a cellphone and turn it into a medical testing platform. A nurse or aid giver in the field takes a blood or saliva sample, places it into the device and sends the picture to an automated database which will return data on the required information (such as red blood cell count). That information can be used to diagnose the patient. Ozcan describes some of the potential for the LUCAS microscope in the video below. It was taken when he won another award, this one from Net Explorateur, earlier in the year. The LUCAS attachment for cellphones looks like one of those rare technologies which could make a significant impact quickly and effectively. Ozcan has already secured enough funding to field prototypes of the device around the world. It should start testing trials in the next year, allowing medical professionals in remote (and not so remote) places in Africa to analyze patients for diseases such as malaria. In Lab on a Chip, Ozcan’s team also demonstrated that LUCAS can identify a water borne parasite (in that case Giardia lamblia) which opens up even more possibilities for its use on the continent. If successful in its early trials, expect to see this $10 device popping up all over the globe. Ozcan developed an USB version of LUCAS for use without a phone. Ozcan has already filed patents and started a company, Microskia, in preparation for LUCAS hitting the worldwide market soon. 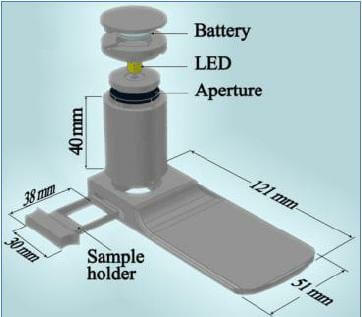 Ozcan and his team have even developed a non-phone version of the device (perhaps the smallest such microscope in the world) which can be used with an USB connection. That microscope can also take density samples (there are associated gains in chemistry and biology for doing so) with a few dollars worth of add-ons. In the long term, the successor technologies to LUCAS should basically transform your smart phone into a medical tricorder. Advanced diagnostic software, likely to be run off servers, would give anyone access to automated medical analysis for their blood and saliva. Such a device could become a valuable tool for everyone, not just those in remote locations, and could become as ubiquitous as the thermometer in your home. When combined with emerging medical artificial intelligence, such microscopes could transform mobile phones into limited household doctors. Such technology is probably still many years away, but Ozcan’s successes show that it could be arriving much sooner than you think.